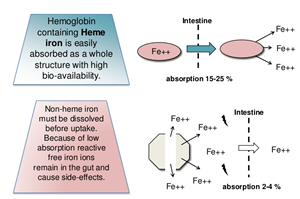 Heme iron is easier for the body to absorb than non-heme iron because of a certain protective structure known as a porphyrin ring. This ring actually helps the iron to be absorbed by protecting it from the effects of other elements or compounds in proximity. The iron is effectively shielded by this ring, so any acids or phytates or other potentially harmful elements simply cannot interfere with the absorption process. In addition, the presence of certain proteins in the system also helps to give the body’s heme absorption rate a boost. This means that if you eat iron with certain other protein-rich products, your body will be able to absorb the heme iron more easily. All of these reasons help to make heme iron the more effective form. If you suffer from an iron deficiency, doctors will usually suggest you start eating more meat and other heme-rich foods. Your body uses heme and non-heme iron in different ways. Your body needs to convert non-heme iron to a usable form whereas heme iron is utilized by a different receptor and easily absorbed. Due to the low absorption rate of non-heme iron, free iron ions remain in the gut causing side effects. The absorption rate of non-heme iron can be hindered by the presence of other compounds. Vitamin C actually helps this form of iron to be absorbed more readily, so doctors often recommend that drinking orange juice or other vitamin-C rich products whenever they ingest iron. However, many compounds can make the absorption process quite difficult. A top example would by polyphenols, found in tea, coffee and wine. These antioxidants prevent non-heme iron from being absorbed into the body. Any iron you absorb is taken into a sort of storage tank (known as a labile iron pool, scientifically) where it remains until the body needs to use it for various processes. Both heme and non-heme iron molecules are placed in this tank. Therefore, when the body finally needs to use some iron, it simply takes some from the tank (it could be heme or non-heme) without differentiating between the forms.